Welcome! 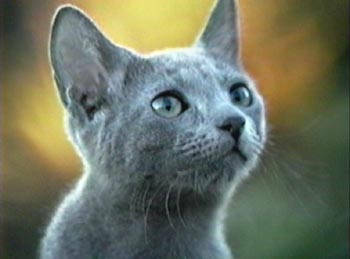 I am Itty Bitty, a real female Russian Blue cat who now lives on in cyberspace. My online home here is an evolving and expanding place with information, resources, links, a newsletter, and opportunities for cat lovers everywhere to find out about me and to interact and share stories about cats with one another and the entire world. In the picture above, you see me with my friend Ellie the elephant. Click on the thumbnail photos below to see newly discovered, artful black and white photos of me when I was less than four months old. 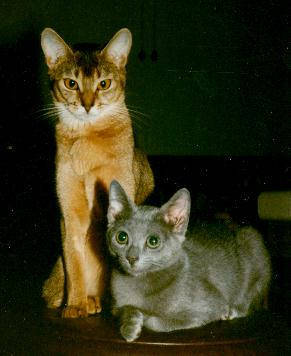 In the photograph above, I am seen as a kitten (summer 1990) with my older friend Bast, a.k.a. Bastet, a female Abyssinian. The above photograph is my human companions' current favorite. It shows me enjoying the afternoon sun and fresh air on the rocks outside of my home on Mt. Helix in the spring of 1991. 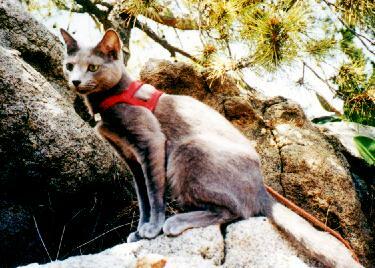 I used to like to spend time outside but my companions, in order to make sure that I wouldn't wander off chasing a bird or some other small prey, always took care to put on my pretty red harness which was attached to a leash. Cool! If you have a Java-enabled browser (usually 4.0 or above versions of Netscape or Internet Explorer), select this link to see a favorite photo of Itty on the "other shore." Click here to see photographs of Itty Bitty on the road. . .have cat carrier, will travel. Click here to access a page featuring several more photos of Itty engaging in some of her favorite fun antics. Select this link to read a poem, Itty Bitty, the Charismatic Kitty, written by Kathi. Click here to read Peter and Kathi's Tribute to Itty Bitty originally published May 11, 1998 at the Candle Ceremony Tributes page at www.petloss.com. Itty Goes International Itty Bitty The Russian Blue Cat now has three international foreign language pages: in French (en francais), in German (auf Deutsch), and in Spanish (en espa�ol). From her new home in cyberspace, Itty Bitty says: "My close human companions, Peter and Kathi, have designed this Web site as an expanding memorial that also provides information and networking resources for cats and their people friends from all over the world. In addition to the features above, there are the Favorite Links below and on the new Itty Bitty Links page, which may be useful and/or entertaining for people who like cats. There is a new BeSeen.com Guest Book, and also the Original Archived Tripod Guest Book." Please visit the BeSeen.com Guest Book. Read the first entry, from Itty, and see what other visitors have written, and also post your own thoughts. 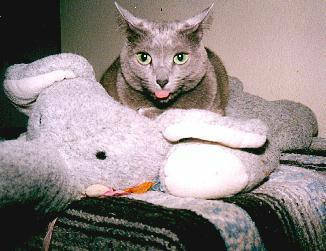 About the interactive Itty Bitty the Russian Blue Cat Message Board: In early March 2001 InsideTheWeb.com stopped hosting message boards including Itty Bitty's. Threaded messages that were posted on Itty's board between May 1998 and March 2001 have been saved and may eventually be made accessible here. In the meantime, please use the BeSeen.com Guest Book to post messages while we search for an appropriate new host to continue the threaded discussions. Visit the archives of Itty's original Tripod Guest Book. Featuring entries from visitors to this site starting in late April 1998. Ekaterina the Russian Blue Kitten Watch her grow!